As a career and business consultant and coach, I focus a lot on teaching clients how to identify and market their key skills and accomplishments. Usually, we think first about the "hard skills" -- the skills that have a tangible result at work. For example, the things they probably learned how to do in a class or someone taught them in a previous job. It's important to focus on those abilities when job hunting, as employers need to know that you are capable of getting the work on their (likely long) list of "must haves" documented on job descriptions. More and more, however, employers are including "soft skills," also known as "emotional intelligence" in their requirements. Soft skills include: leadership, written and verbal communication, problem solving, motivation, interpersonal skills and creativity. It's not surprising that soft skills continue to play a big role in hiring decisions. Employers realize that they can teach hard skills, such as how to use a software program, but it's virtually impossible to retrofit employees with soft skills. A study from Millennial Branding showed soft skills topped the list of "must have" skills that employers want, with 98 percent of employers saying communication skills are essential. Early in my career, I learned a lot about the value of written communication as an editor for publications at a Wall Street firm. A new college graduate, I worked with many brilliant financial minds to help them explain the markets to their clients. Just one word out of place could give someone the wrong impression. I saw how difficult it could be for people who could explain a strategy to a client in person to put those same concepts together in writing. Our department's job was to take their words and ensure they made sense when read. Over and over again, I noticed how adding (or subtracting) a comma or changing a phrase could alter the entire document. (For better or for worse!) Careful reading is so important to success in written communication. In my second career as a career advisor in a university setting, I learned a lot of lessons about communicating well face-to-face. I remember the very first student I met for a resume review. I pointed out a few things she had included on her resume and asked her, "So what?," intending to help her focus and clarify her accomplishments. Having come from Wall Street, where verbal communication tends to be very direct, it didn't occur to me that she'd react poorly to the inquiry and think she needed to rewrite her entire resume! It was a great reminder for me to always think about the person who needed my help and adjust my communication accordingly. I certainly didn't want to offend students via blunt questions about their marketing materials. I find today, working with more business owners and experienced professionals, I do sometimes communicate bluntly to make a point. The lesson is that communication is a two-way street. It doesn't really matter what you intend to say, or the takeaway you expect. 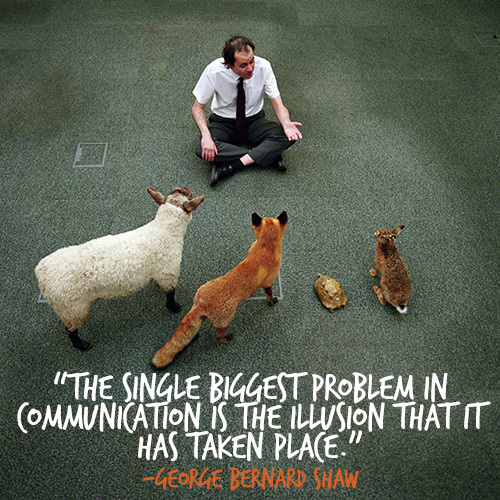 What matters most is how the person or group will receive your communication. Like marketing; it's important to think first of your target audience when you put your thoughts together to share with someone else. Check out more quotes on being a good communicator here.